Posted by Eddie & filed under Military/Aircraft, Mountains & hills, Travel, June 16 2007. After our time in Jasper, Lesley and I drove (it was Lesley’s first time using an automatic gearbox and driving on the right; she took to it with no hesitation at all) to Golden in British Columbia via Yoho National Park and the Kicking Horse Pass. Roads and trails were closed due to snow here as well, and we couldn’t visit the Takkakaw Falls as planned due to the Yoho Valley Road being closed. 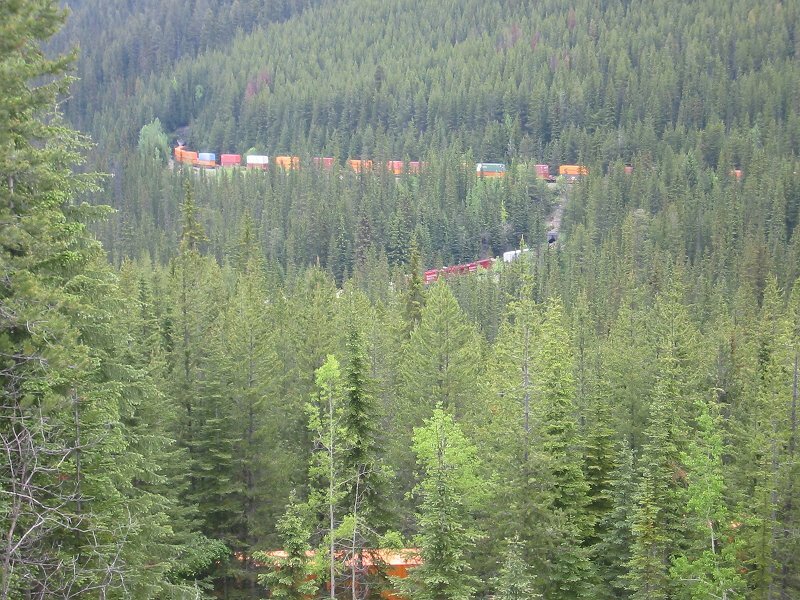 We were fortunate enough however to see the unusual sight of a long freight train disappearing into the famous spiral rail tunnels of the Kicking Horse Pass and re-appearing simultaneously at a completely different angle from the mountainside (photo here)! We also visited Emerald Lake in Yoho, which is not as well-known as Lake Louise and Moraine Lake nearby in Banff National Park (both of which we also had visited previously), but is less crowded with tourists and is just as magnificent in my view. 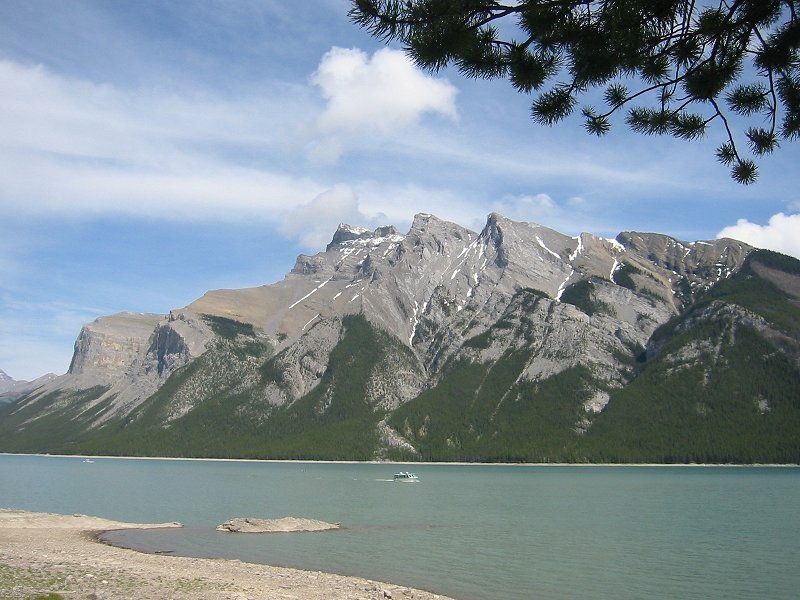 Another thing that makes Emerald Lake interesting is that the mountain slope site of the Burgess Shale can be seen from it (although visiting it requires a guided hike). The town of Golden is not situated in any park, and is a regular, non-touristy place in British Columbia. Lesley and I spent the evening in a local bar and it felt like we were the only tourists there (especially when the Alberta Hell’s Angels came in). It was here that I decided that Kokanee was the best Canadian beer. From Golden we then drove to Radium Hot Springs down the Rocky Mountain Trench. This road is not on the usual tourist trail but it was a truly great drive with magnificent views of the Rockies on our left and the Purcell mountains on our right. After Radium Hot Springs we drove back into the Rockies via Kootenay National Park and the Vermillion pass. 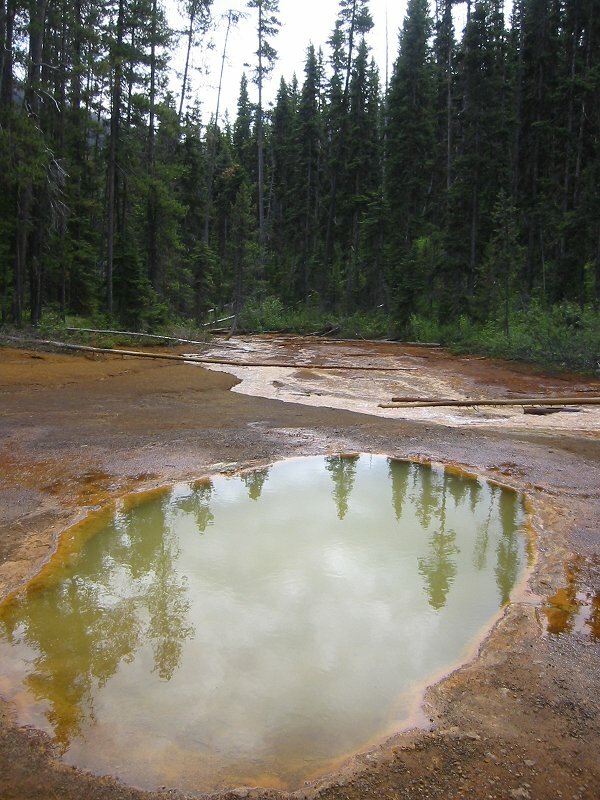 In Kootenay we walked the short hike to the ‘Paint Pots‘ – pools of brightly coloured water surrounded by beds of ochre earth, which was an unusual sight in the middle of the mountains and trees – reds and yellows amongst the usual blues, whites and greens (photo here). We also visited Lake Minnewanka near Banff. This is a lake with an unfortunate name, and even more unfortunately, a woman skier was eaten by a cougar here in 2001. In the June sunshine it was a magnificent and beautiful place though (photo here). We then spent one night in Canmore, after which we drove into Kananaskis Country. Kananskis is perhaps the biggest secret of the Canadian Rockies – it is only 45 minutes drive from Calgary but contains mountains and woods that rival anything in Banff or Jasper. Not being a national park, it receives almost no tourists and hence offers more of a remote and wild experience. The main route through Kananaskis was closed after the turnoff to Kananaskis Lakes, but the lakes are in a magnificent spot so we still got great scenery (photo here). 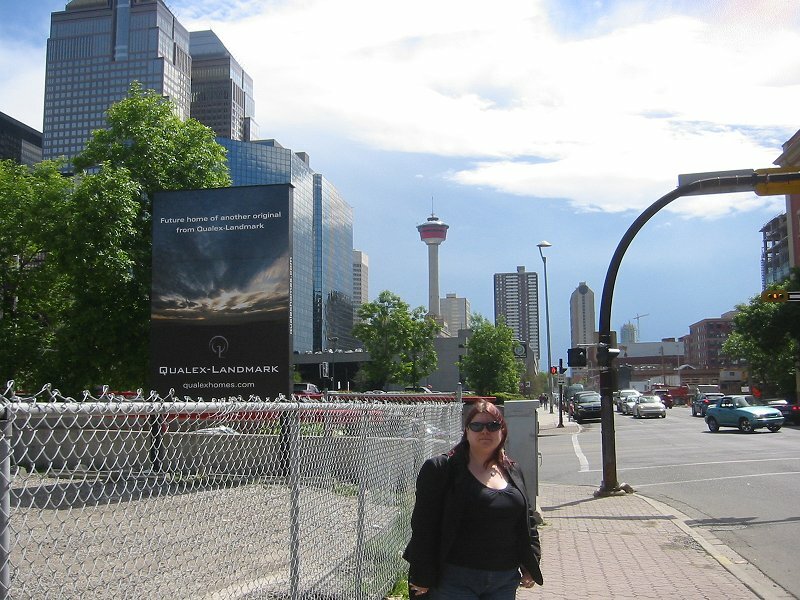 We spent the remainder of our trip in Calgary, exploring the malls, bars (more Kokanee) and restaurants in the city. Highlights for me were eating a genuine currywurst from a street stall (just like I remember from Germany) and the best meal of the whole trip, a steak in Caesar’s Steak House on our last night. Calgary is also a real cowboy town so Lesley just had to buy a pair of cowboy boots. We went up the Calgary Tower, which has very impressive views of the city, with the plains to the east, and the Rocky Mountains to the west (photo here). The CN Tower in Toronto (which Lesley and I visited 3 years ago) is taller, but it doesn’t have the Rockies as a backdrop! We also visited an old schoolfriend of Lesley’s who is now married with a baby daughter and lives on the outskirts of Calgary. It was great to see what it’s like to live in Calgary (as opposed to just visiting it as a tourist) – we were treated to barbecued chicken and beers in their large house. Having the Rockies on your doorstep and being next to such a pleasant and appealing city as Calgary is certainly something to be envious of. A few days before we went to Calgary, we heard that Prince Harry, of all people, had been spotted in one of the city’s nightclubs. He almost certainly was there as part of a British Army deployment to BATUS, which is where I first learnt about Calgary and Alberta, as one of my schoolfriends lived there in the early eighties when his dad was based there. 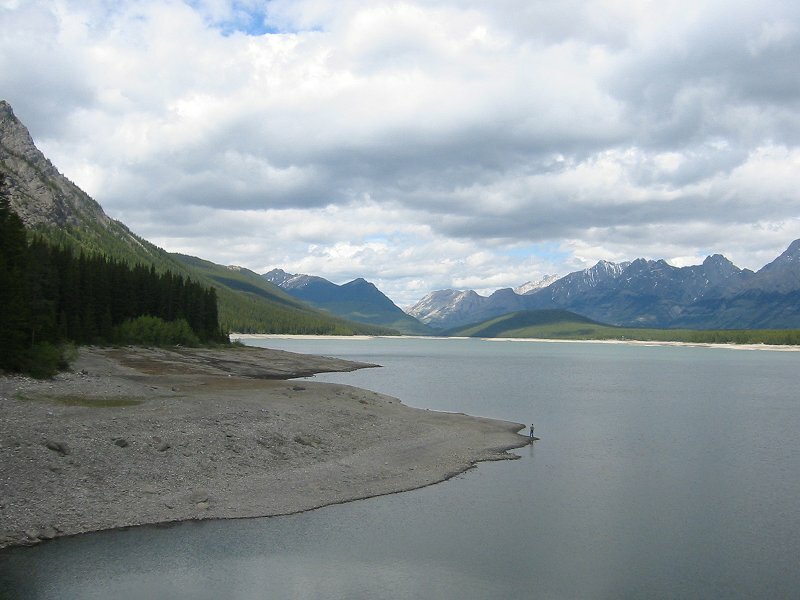 Ever since then I’ve always been fascinated by the place – I’ve been there for two visits now (the first time in 1998) and Alberta really is a remarkable place. Whilst waiting for our flight back to Glasgow at Calgary Airport, I noticed that the departure area was full of uniformed British military personnel (presumably from BATUS), and I later had an excellent view of their RAF VC10 taking off. Maybe it was the same one I saw at Brize Norton in May as noted in the previous posting ‘Ancient and modern sites in England‘? On the subject of UK military aircraft in Canada, during my previous trip to Alberta in 1998, the Air Transat flight I was on made an unscheduled refuelling stop at the deserted arctic NATO airbase at Goose Bay in Labrador. This made an already unpleasant flight (Air Transat are not recommended) much longer than expected, but during the stop the aircraft doors were opened and I got an excellent view of an old Vulcan bomber parked on the runway. This was an odd and unexpected sight in such a remote spot. You can read more about this Vulcan here.